Vayanatt KulavanVayanatt kulavan can be considered as one of the most furious and acrobatic theyyams which are performed. The ferocious state is expressed in a comical way. Theyyam is usually performed with a bit of holy alcohol called Toddy. Vayanatt Kulavan is believed to be originated when Lord Shiva and Parvathi took the form of Hunters. The tale of origin is associated with Lord Shiva and Parvathy. Once they were travelling through forest called madhuvanam. Madhu means Toddy(Alcohol) and Vanam means Forest. Lord Shiva used to intake the toddy that used to drip from the trees(During those days, toddy used to drip from the bottom of the trees). Parvathy disliked this habit. One day when Shiva went for the intake, he found that the toddy which used to drip from the bottom had gone upwards. This agitated him. Shiva became furious. This trick was infact done by Parvathy Devi. In order to fetch the toddy, Shiva created a devine person, by tapping on his thigh. This devine person is considered as the son of Shiva, Son was assigned the taks of fetching toddy from top of the tree. He got on top of the tree and started having the toddy himselves. Lord Shiva warned him not to have toddy from madhuvanam. The son ignored the warning and continued the consumption. Lord Shiva became angry with this and cursed the son to go blind. Later he was provided with “False Eyes” and sent to earth to protect the people. It was in wayanad where he first descended on the way to earth. He was thus called Wayanad Kulavan OR wayanatt kulavan. Wayanatt kulavan who was destined to fetch toddy for Lord Shiva had a lot of folllowers and theeya caste seems to be originated in this fashion. Wayanatt kulavan theyyam is usually performed during the night time with the aid of light generated by lighting the dry coconut leaves torch(Chootta or Choott) During the first journey of Wayanatt Kulavan theyyam, the torch gets lit off and theyyam threw the torch as well as the silver eye(False eye). The place where the torch and the silver eye fell is now a holy place and Wayanatt kulavan theyyam is usually performed yearly at this place. Hunting is an inevitable act in Wayanatt Kulavan theyyam performance. The story of origin goes in this fashion. A person called Mannappan who hail from mangatt, in kannur district and belong to theeya caste, later became devine and peroformed as theyyam widely known as kathivanoor veeran. Mannappan was born to kumarappan and chakky couples. The naughty nature of mannappan lead him to be a headache for the family. One day mannappan was forced to exhile from his home and travel towards the Kodague currently know by the name Coorg. Though he had setout along wtih friends, they intoxicated him and thus Mannappan was set alone. Mannappan, with the help of a female called Chemmarathy found his relative in Coorg and got settled there. Mannappan started living by farming there and became an abled youth. When it became time for the marriage, mannappan decided to marry the female whom he met on his way to Coorg, called Chemmarathy. Soon, they got married. Mannappan used to travel long distance in pursue of the farming jobs he had. Chemmarathy used to argue with her husband when he became late to home. One day warriors in Kudag area started war on the area. Chemmarathy challenged the strength of Mannappan to fight the warriors. She openly announced that Mannappan would not be able to survive a battle. Mannappan was an abled warrior. He set out for the war. Though bad omens were already started showing right from the time he set out. Inspite of all those, Mannappan continued his way to battle field. Mannappan fought with all his expertiese and the enemies fled. On his way back, he found that one of his fingers and finger ring were lost in the battle field. Loosing them was a smash for the pride, Mannappan went back to battle field to fetch them back. Kudag warriors were hiding in the battle field and they adopted unfair means to end Mannappan. He was killed in the battle field by un ethical manner. Mannappan’s relatives gathered and decided to burn him in the graveyard. Chemmarathy who could not bear the demise, gave her line along with the burning body of Mannappan. Mannappan’s relatives had enlightments through dream and thus Mannapan and Chemmarathy were considered divine and performed as theyyam. 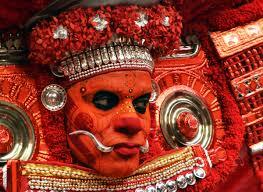 Kathivanoor Veeran was the name given to this theyyam. Kathivanoor veeran theyyam is widely acclaimed for its physical and acrobatic peroformance. Kathivanoor veeran theyyam is usually performed during the night time or early morning. The courtyard where Kathivanoor veeran is performed will be decorated with a special basement, called Chemmarathy Thara. Above this a lot of decorations are done using the stem of banana plant. Vellattom of Kathivanoor Veeran theyyam will be displaying a lot of Kalari steps.